We first got acquainted with the HTC Trophy during last winter when it was looking to sport the last-gen Windows Mobile operating system, but this time around, it's clearly looking to shed its humble and deep roots. The Global Certification Forum recently approved a device named the HTC 7 Trophy and is most likely going to be bound for the European market. As the name kinda suggest, we're probably going to see it sport Windows Phone 7 since the device never launched and was possibly shelved by the Taiwan manufacturer until a suitable time came along. 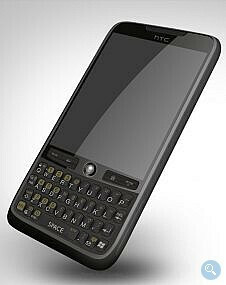 Although the rendering of the image in question isn't the actual device, it undoubtedly can provide some insights as to what the HTC 7 Trophy might ultimately end up looking like. Some of the features mentioned when the HTC Trophy came bursting onto the scene were a 3” capacitive touchscreen, 512MB ROM, 256MB RAM, quad-band GSM, dual-band UMTS, and its all too conspicuous physical QWERTY keyboard. Throwing in the “7” into its name might make it fitting to be a Windows Phone 7 device – which means that it can potentially see a launch this fall. Generally, it takes approximately six to eight weeks for a phone to be released once it receives GCF approval – so you never know what can happen with this one.